The Canterbury marimbas and vibraphones were the premier instruments designed by Clair Omar Musser for his company, Musser Marimbas, Inc., during the 1950s. 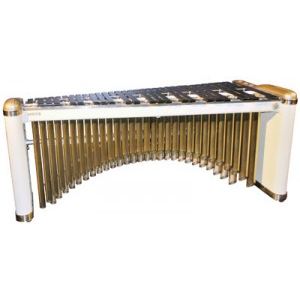 The Model 500, with a 4 1/3-octave range, featured a contemporary design with dual, arched, brass resonatorsThe metal pipes that extend below the bars on a marimba, xylophone, or vibraphone. They carry t... finished in a bright, burnished gold. The ivory-finished wood and metal frame had a streamlined shape, was decorated with gold-colored trim, and featured recessed wheels for an elegant appearance. This Canterbury marimbaAn instrument that consists of a large frame and a set of tuned wooden bars which are struck wi... was the personal instrument designed for and owned by PASThe Percussive Arts Society is a music service organization whose mission is to inspire, educa... More Hall of Fame member Clair Omar Musser, who then sold it to Leigh Howard Stevens, also a PAS Hall of Famer. The bars, which range in size from 1 5/8 x 3/4 x 7 1/2 inches (high C) to 15/16 x 2 1/2 x 18 inches (low A), were constructed from Black Klyposeros (Cocabolo) trees personally selected by Musser on a trip to Honduras. This growth of Cocabolo hard wood originated on volcanic slopes that produced a high-density of solid resin in the bars. The bars are shaped and tuned in his patented, parabolic contour design. 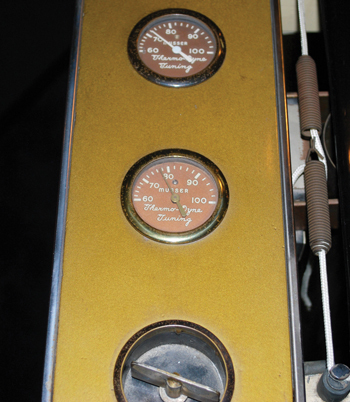 During the final year Musser owned his company, he instructed his chief tuner, Paul Fialkowski, to construct this instrument, “the finest ever built,” for Musser’s personal use. The instrument measures 36 1/2 inches in height, 34 inches in width at the bass end, and 81 inches in length. 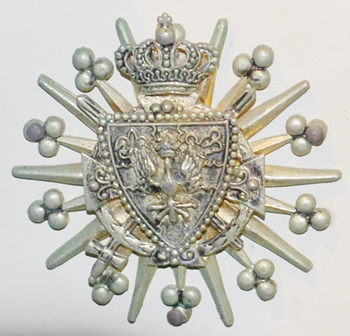 It also comes with the original set of fibre cases and features a unique Coat of Arms plaque. 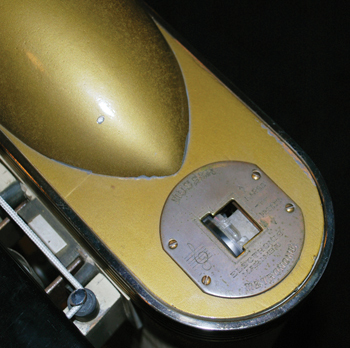 An additional feature available on this model instrument was Musser’s “Thermodyne” tuning system, which allows the resonators to be easily tuned, depending upon temperature and humidity conditions, by rotating a screw mechanism. In addition, this instrument has a built-in “Electronic Marimba MetronomeA clicking device that sets the tempo for a rhythm or song. It measures time in BPM (beats per ...” that adjusts the tempoThe speed at which the music is or should be played. by rotating a dial. 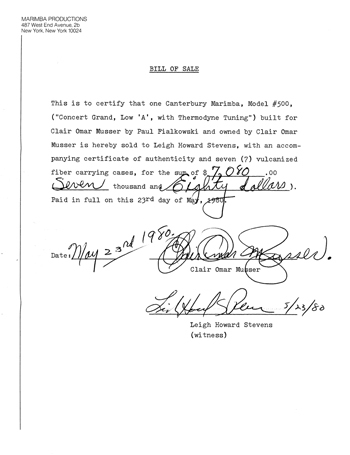 Musser personally contacted Stevens by letter, dated January 1, 1980, and offered to sell him the instrument, which was then purchased by Stevens on May 23, 1980 for $7,080. It was appraised later that year by Harvey Vogel of Lone Star Percussion at a value of $25,000. The list price for this model in the 1950 Musser Catalog was $1,095.